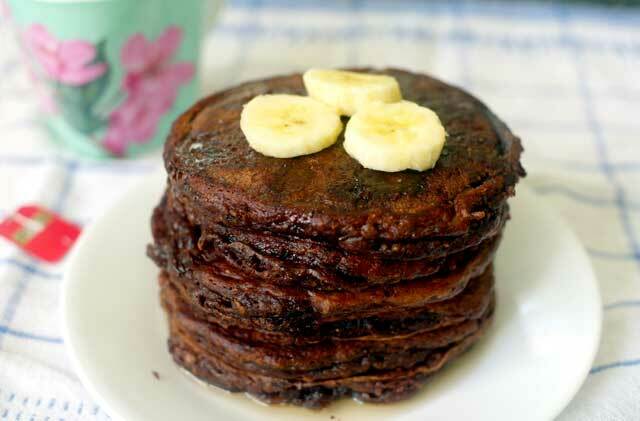 Combine together protein powder, ½ banana, raw oats, egg whites, cocoa powder, and stevia. Heat a non-stick skillet over medium heat, adding oil if desired (not required if non-stick skillet). Pour into the skillet and cook as you would a standard pancake, cooking for 2-3 minutes per side. Serve with second half of the banana and some sugar-free maple syrup if desired. *This recipe is perfect for our standard vegetarian and pescatarian menus. Vegans may replace the egg whites with Vegg (or another egg alternative). This entry was posted in Awesome Breakfast, HAC-Recipes. Bookmark the permalink.